Judith & Zeke look forward to welcoming you to Oaklands, their beautiful Lakeland home. The house was built of local stone in the middle of the 19th Century. It is situated near the village centre, overlooking the bowling green and within a short walk of the lake. 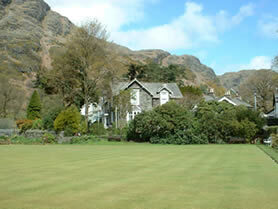 The bowling green itself are nearby grass tennis courts are available for guests of Oaklands to use. we cook everything to order using fresh local produce, including free range eggs and butchers sausage. There is a wide choice of fresh fruit, yogurts, cereals and dried fruit and of course a hearty English Breakfast or a Vegetarian alternative. We offer a high level of comfort, with spacious rooms overlooking the Coniston fells. There is private parking and a large garden for you to while away the Summer evenings. Perfect location, extremely friendly and obliging hostess, clean and comfortable bedroom with marvelous view .